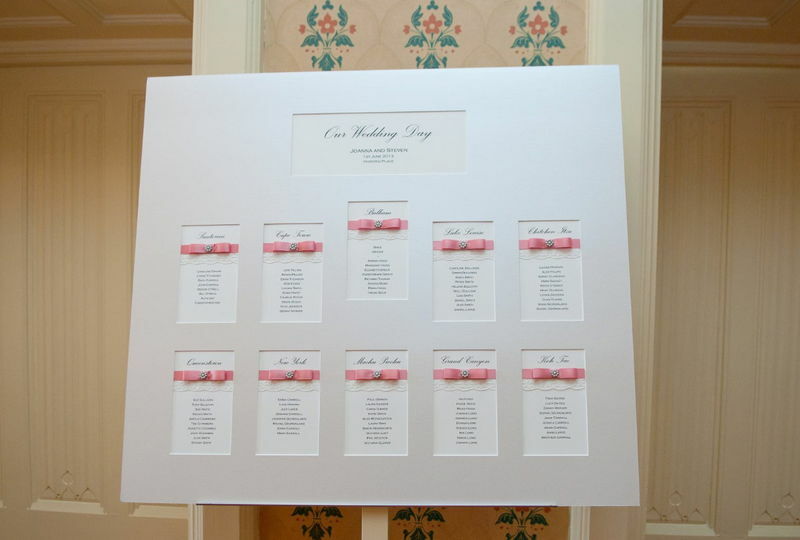 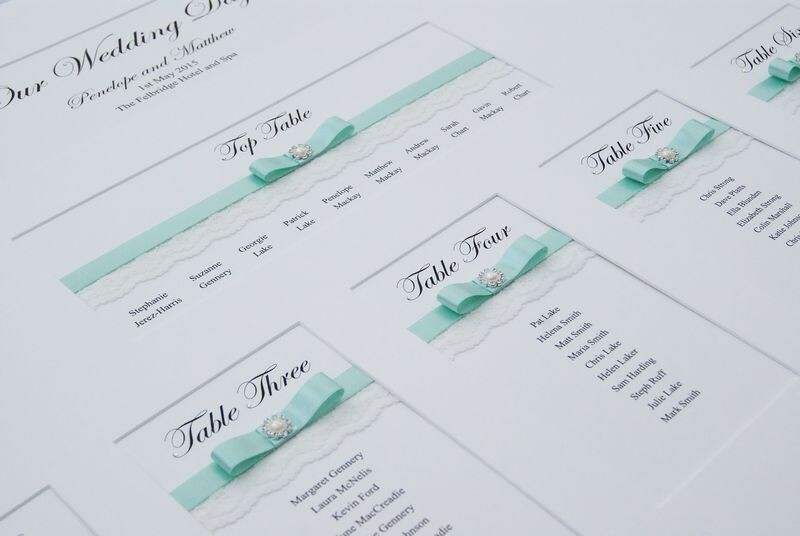 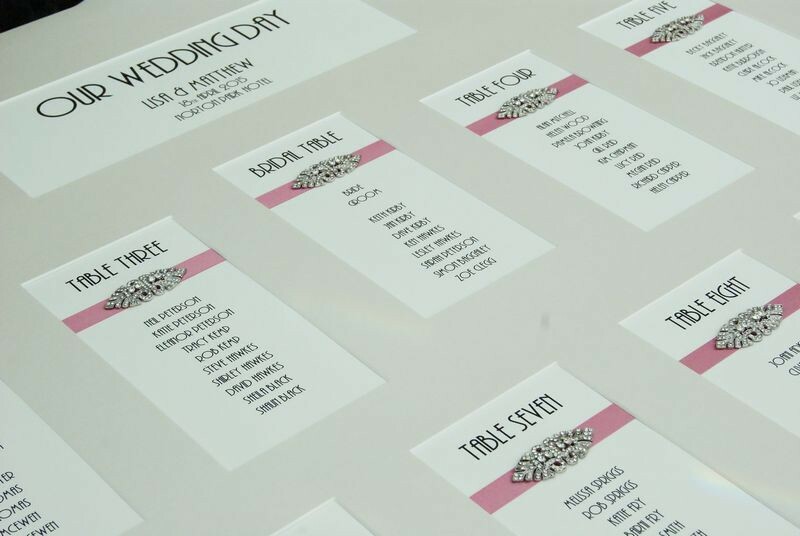 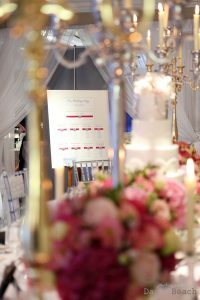 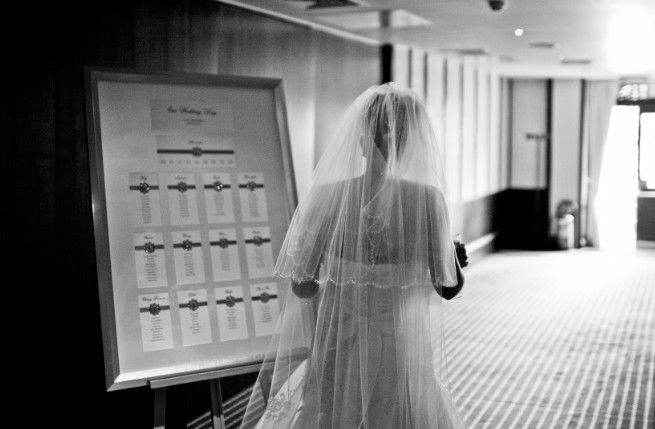 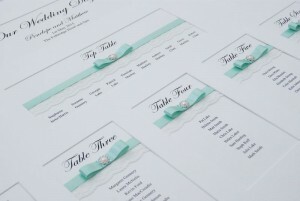 Table plans are an important part of your wedding day and table plans are often the first glimpse your guests will see of your décor on the day (as they are usually displayed outside the wedding breakfast room). 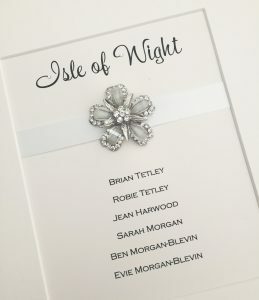 There is a huge choice of styles and designs and they are made bespoke for each order. 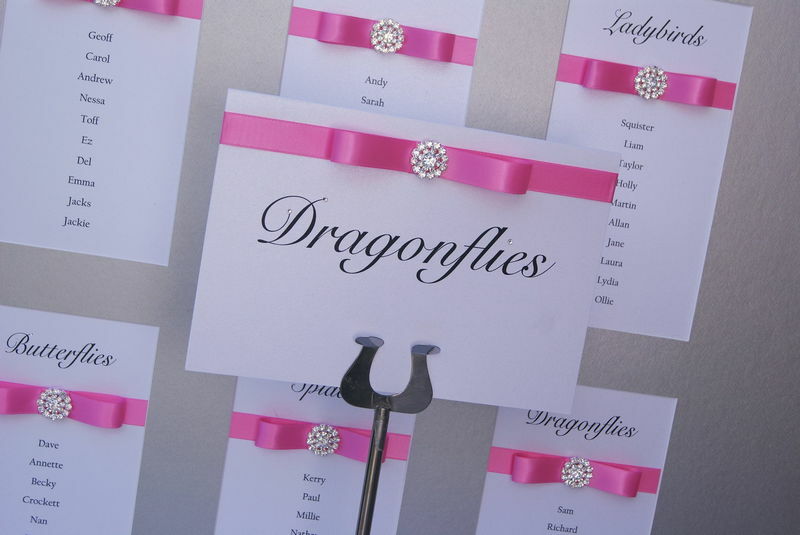 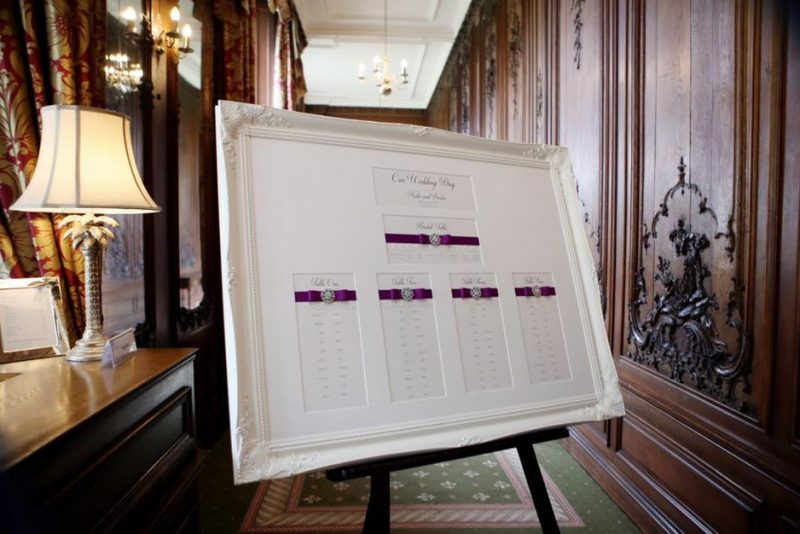 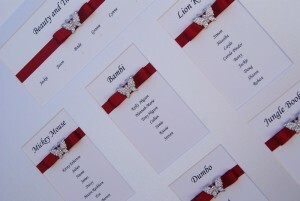 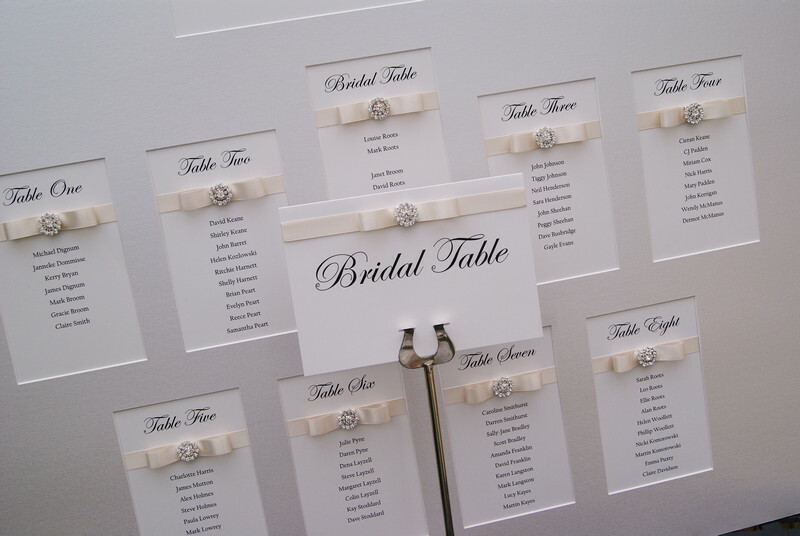 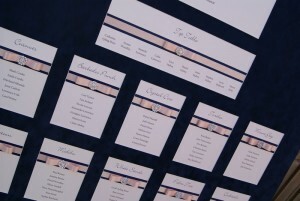 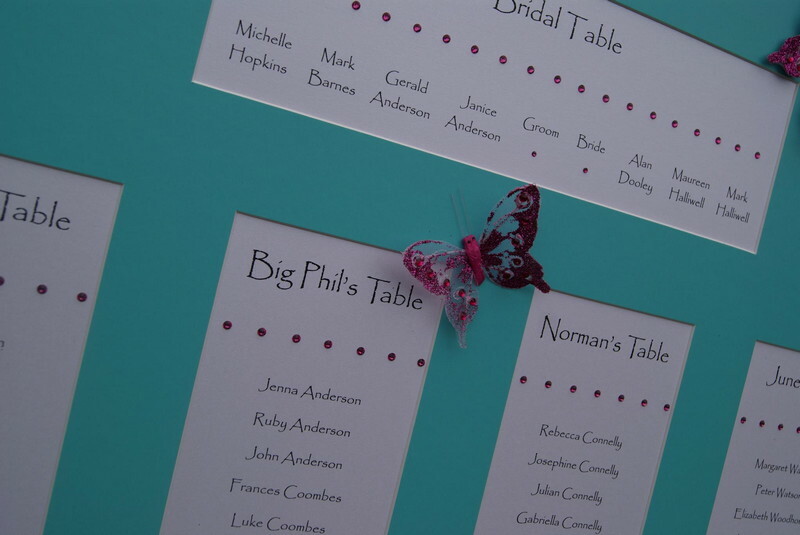 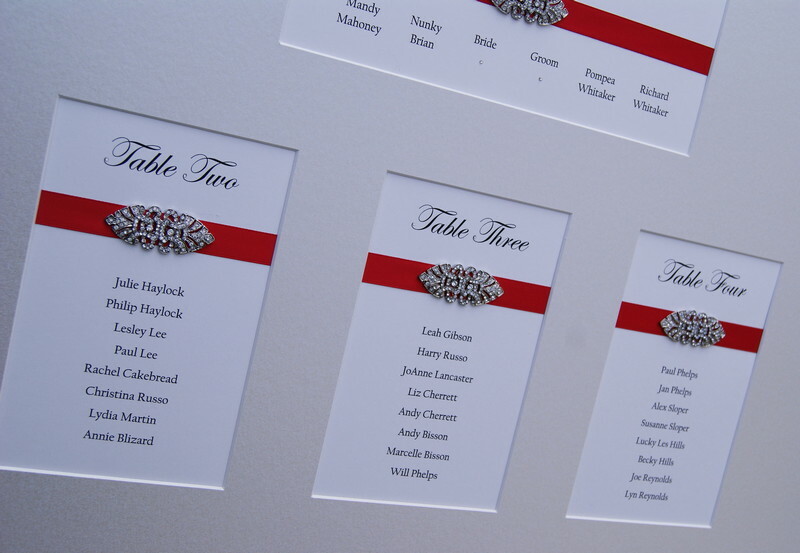 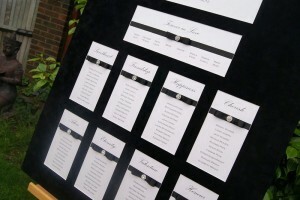 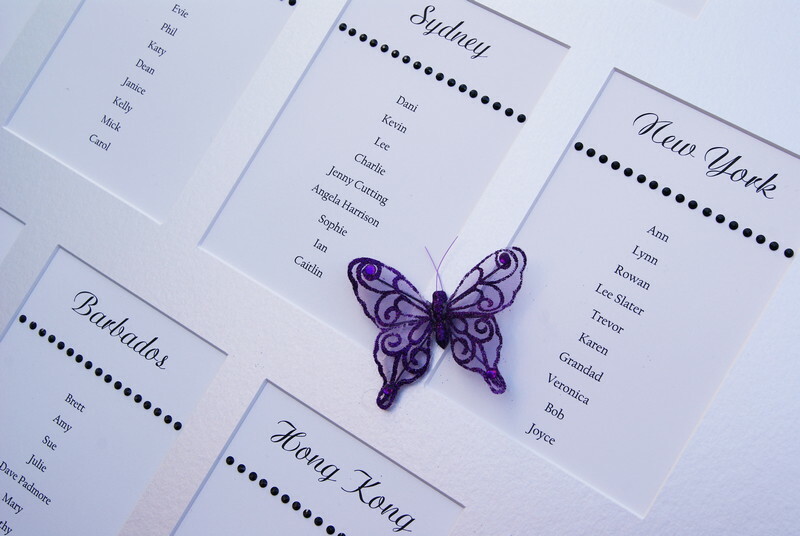 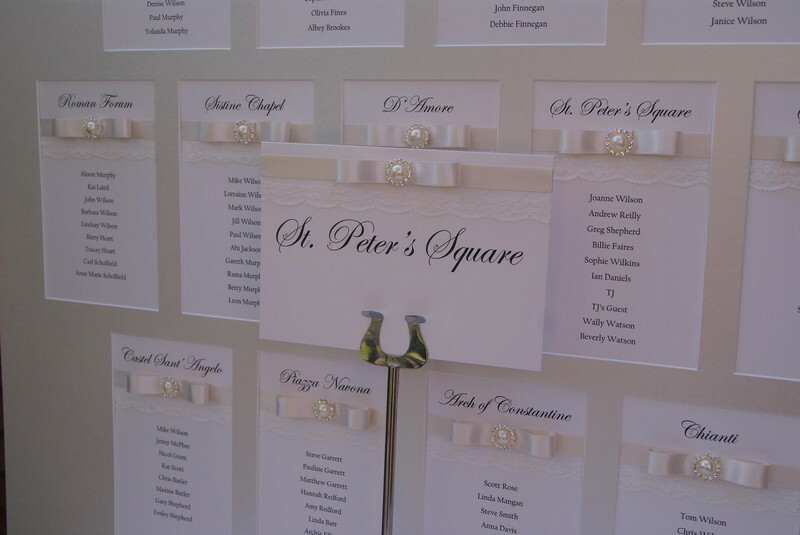 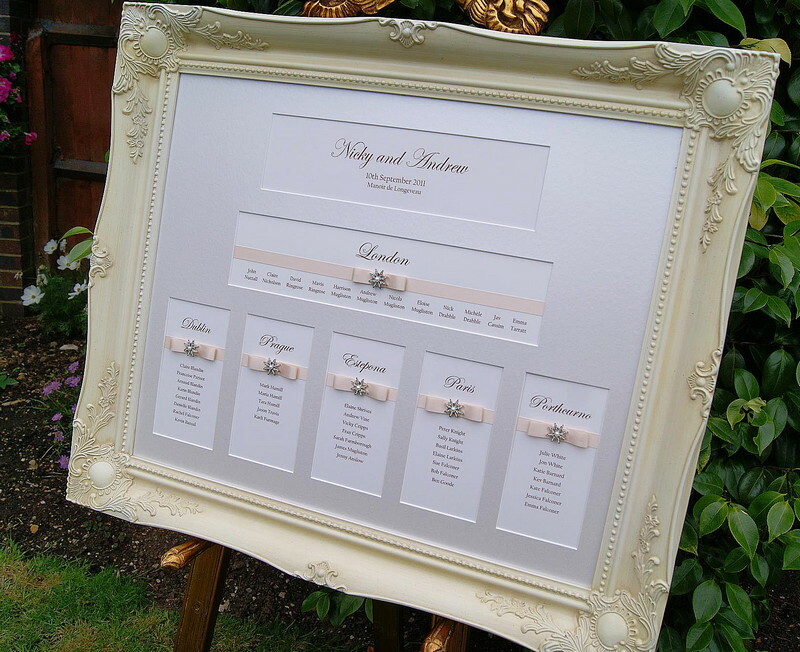 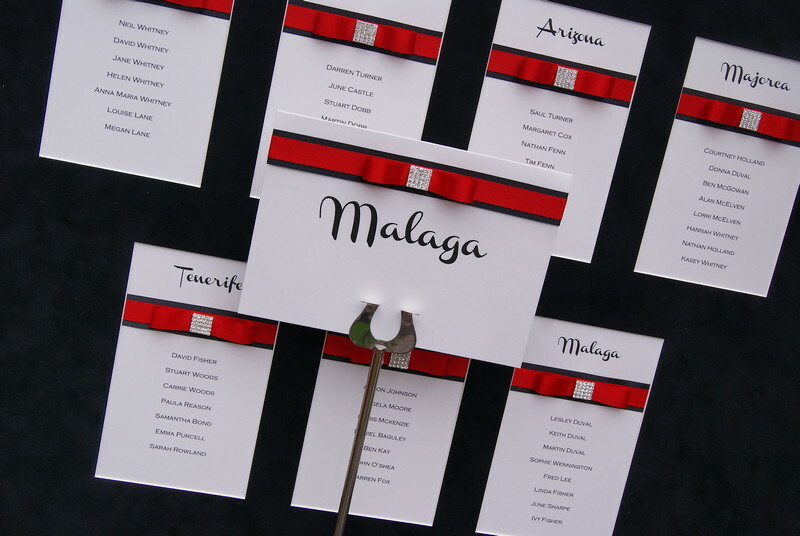 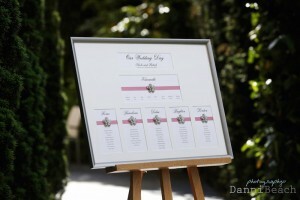 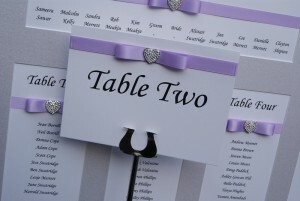 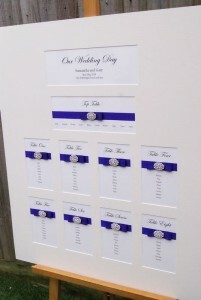 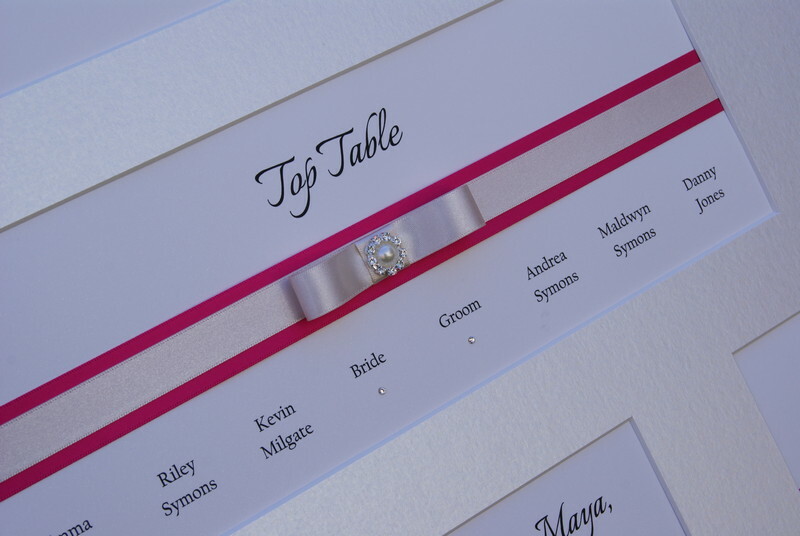 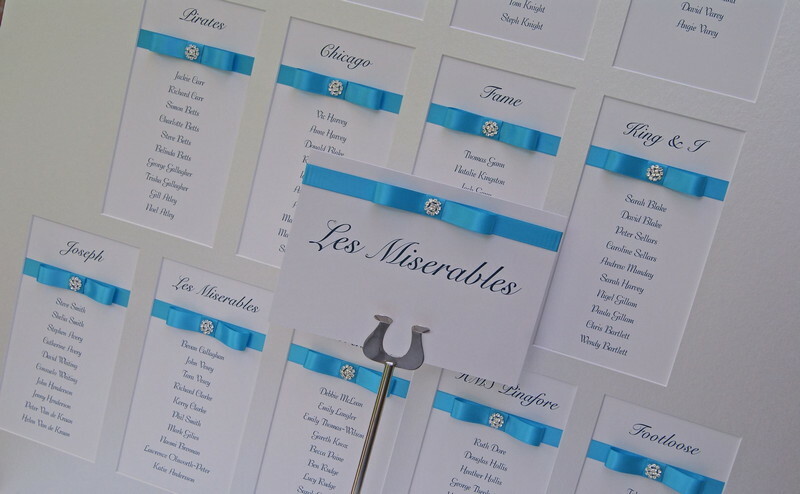 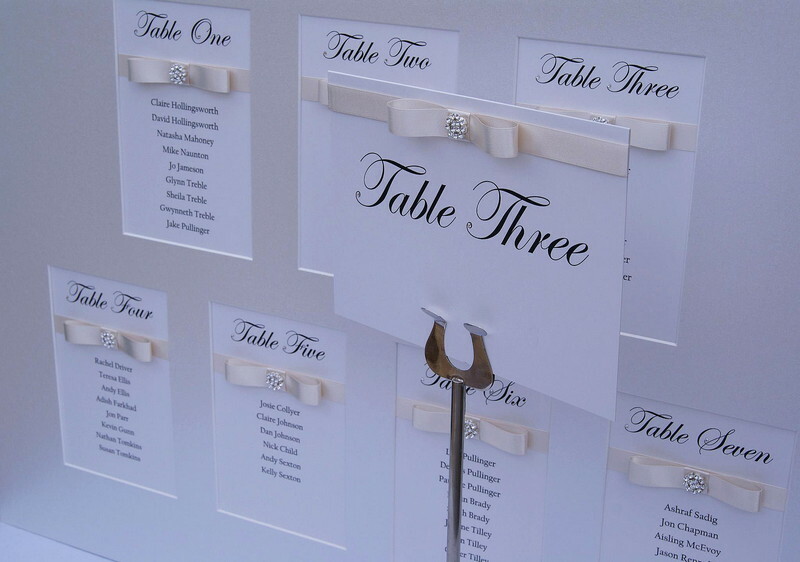 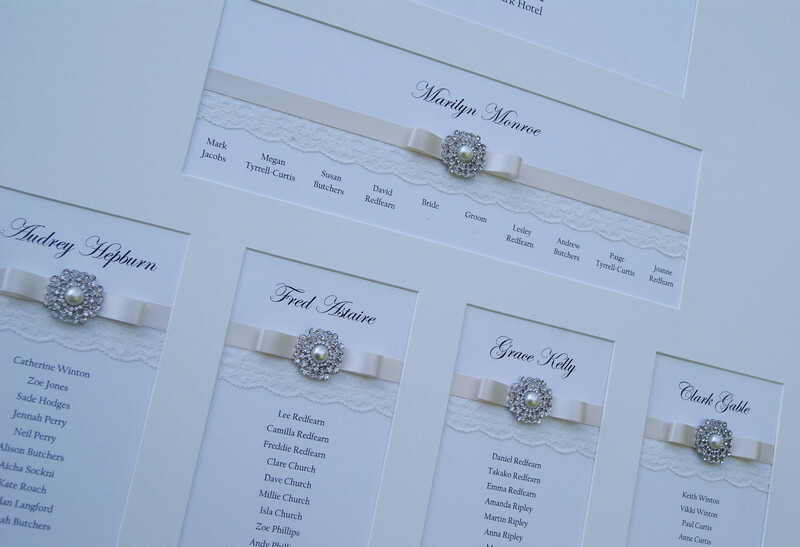 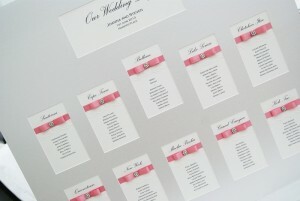 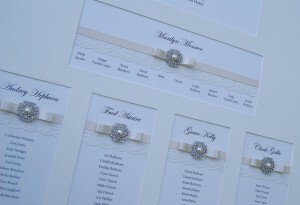 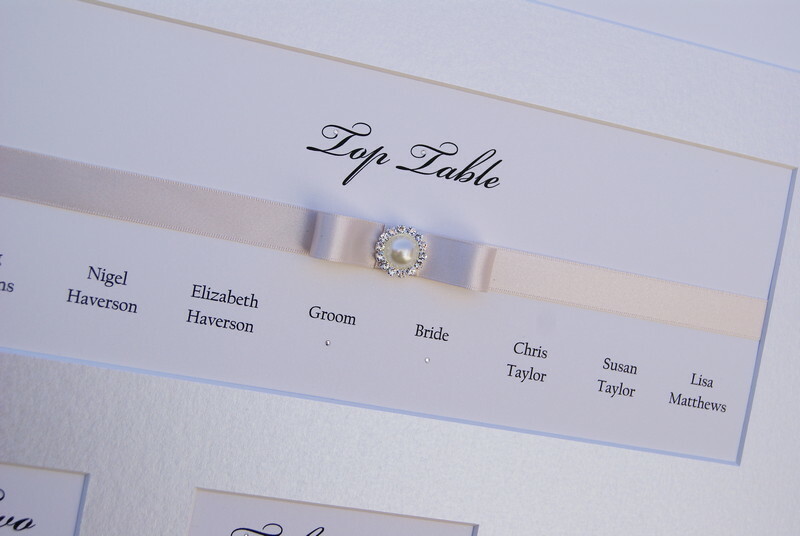 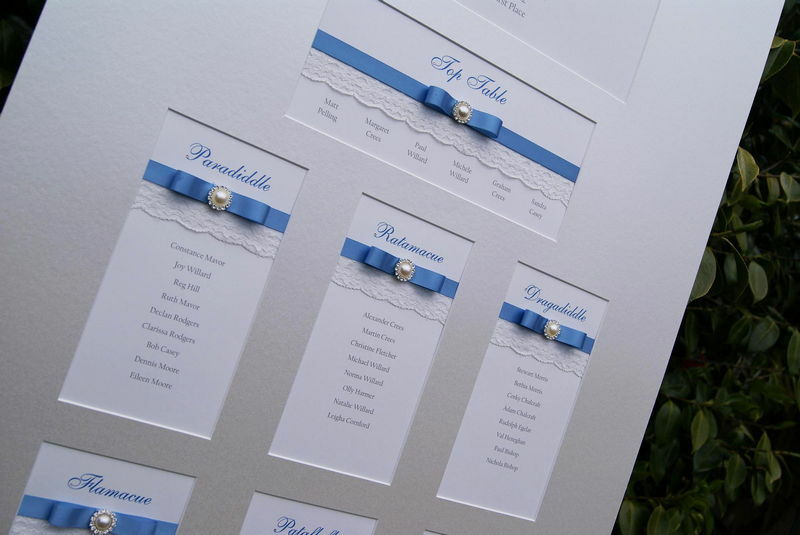 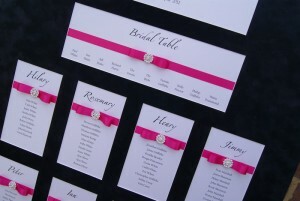 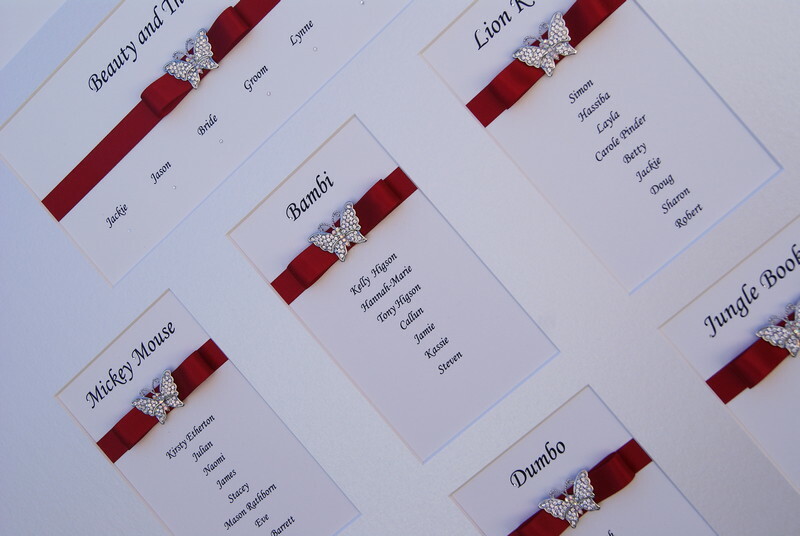 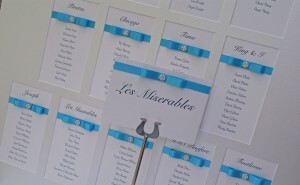 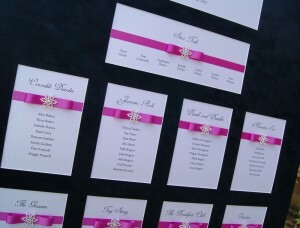 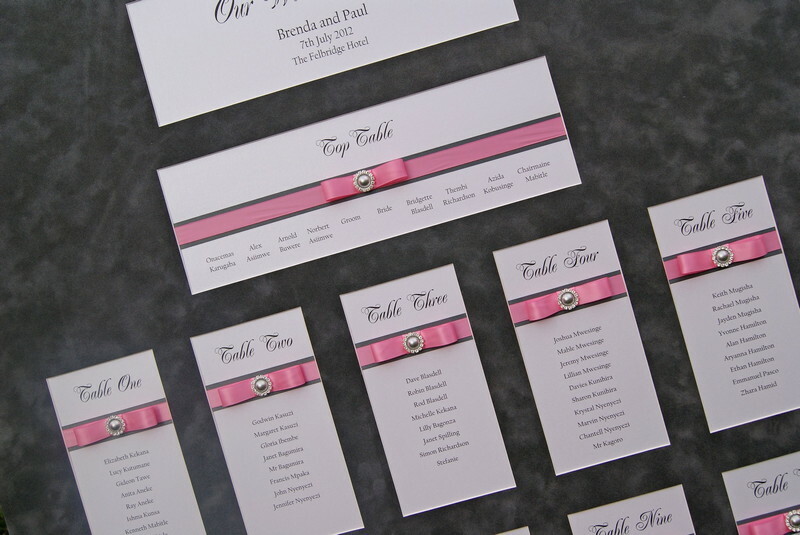 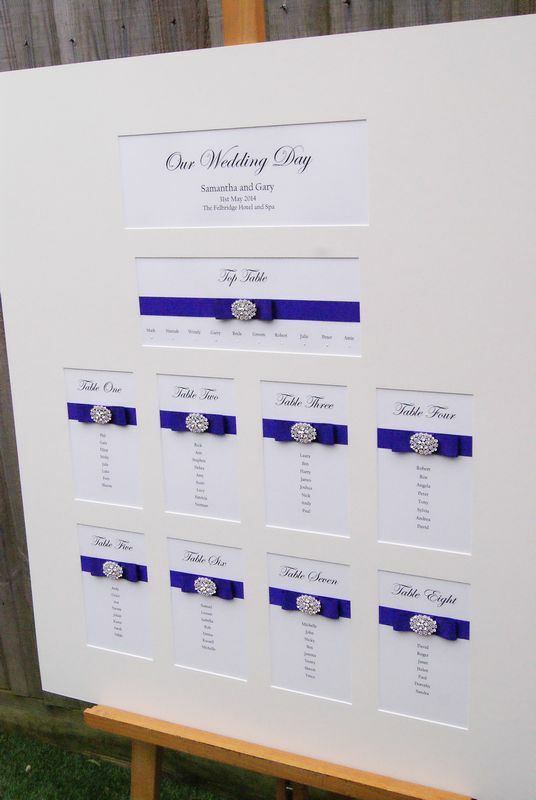 Table plan boards are available in a huge array of colours and finishes including matt, pearl and short velvet. The photos here are only a glimpse of what we have produced but hopefully will give you some ideas and inspiration. 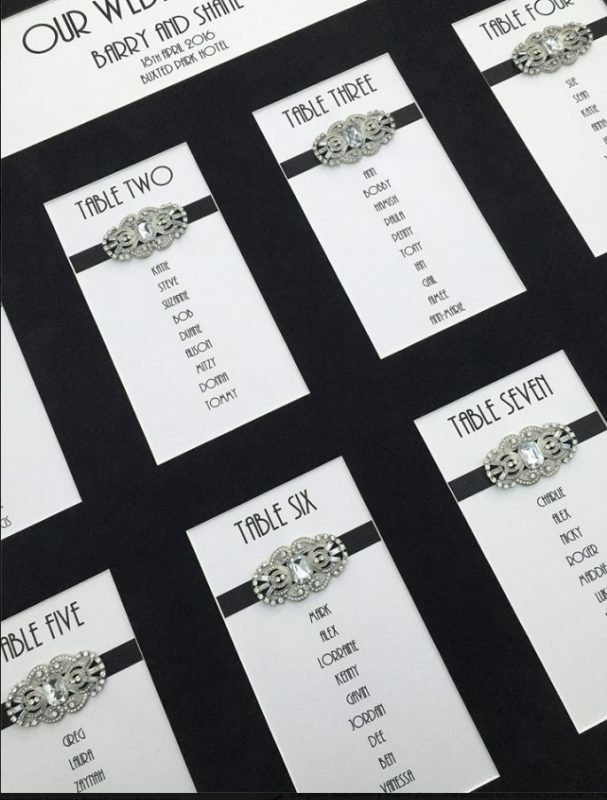 We offer packages for venue stationery (table plans, table cards and place settings) or stationery can be ordered as individual items. Please call Joanne for prices. 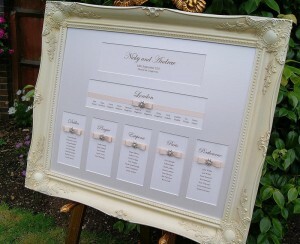 We can purchase ornate frames (shown here) or have frames bespoke made to fit your plan perfectly. 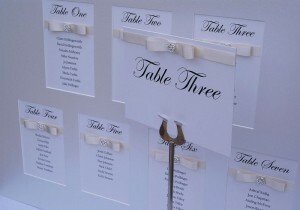 Please ask Joanne for details. Shown with an ivory ribbon, a matching formal bow and detailed with a pearl centre, crystal surround embellishment. 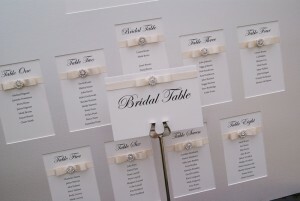 Pearl ivory board, finished with pearl ivory ribbon and matching formal bow. 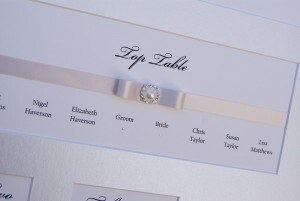 Detailed with a small flat crystal embellishment named dainty. 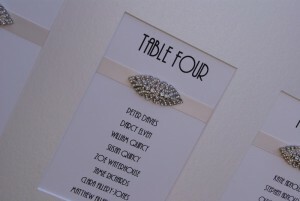 An utterly stunning Art Deco inspired crystal embellishment. 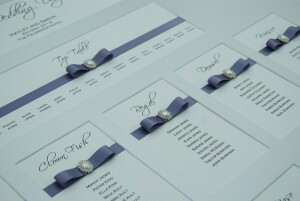 Shown here with Art Deco font and flat ivory ribbon. 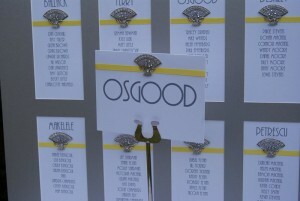 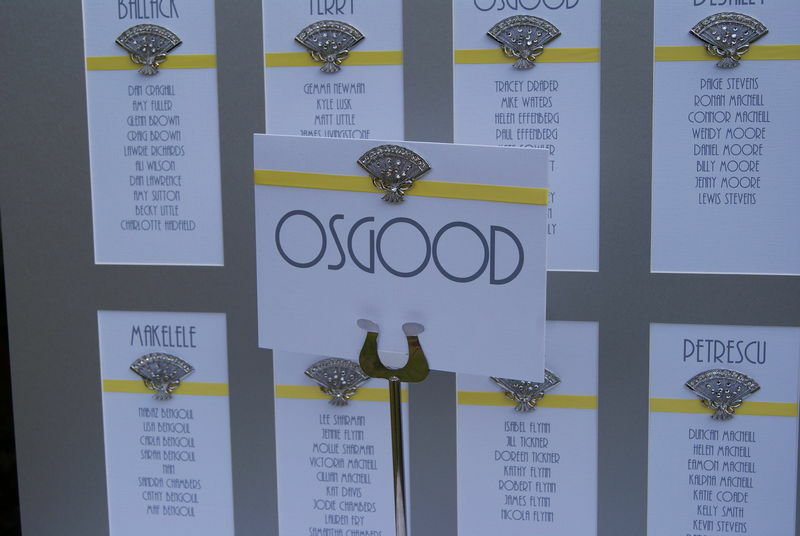 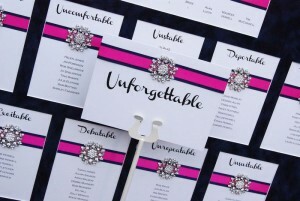 Super stylish and very on-trend for Art Deco and Gatsby styled weddings. 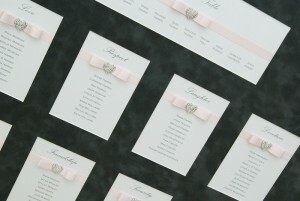 Black short velvet plan shown here with a bright pink ribbon plus a matching bow. 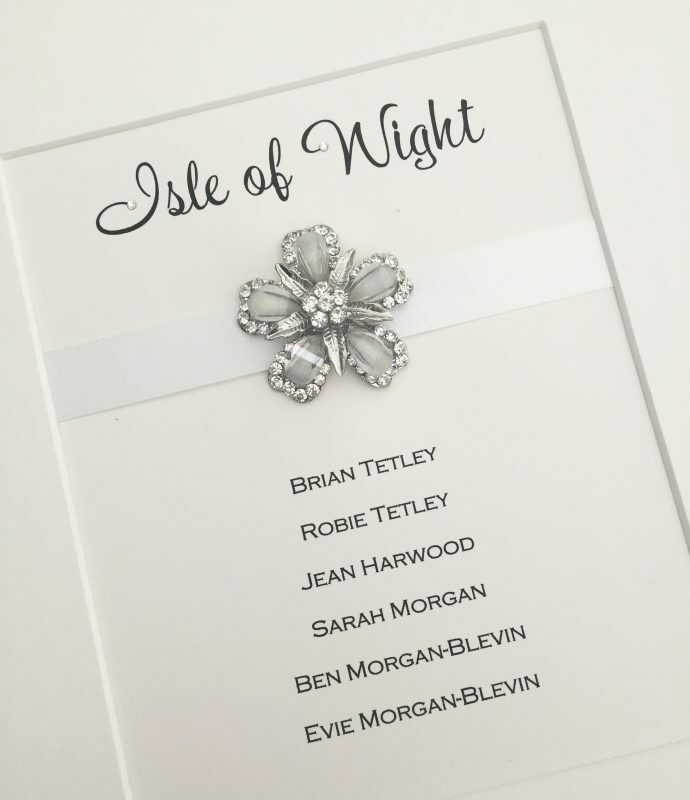 Detailed with a crystal flower embellishment. Black short velvet plan shown here finished with a double run of ribbon plus a matching bow. 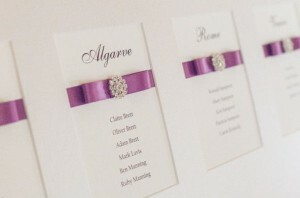 Detailed with a crystal square embellishment. Crystal hearts are still very popular and one of our best sellers. 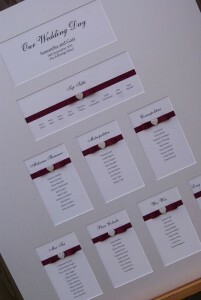 Shown here in ivory board, claret red ribbon with formal bow and finished with sparkly hearts. 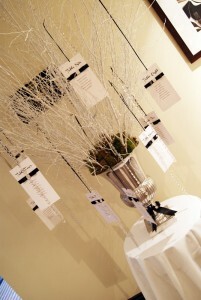 For those wanting something different, we offer an array of tree choices to display as a table plan. 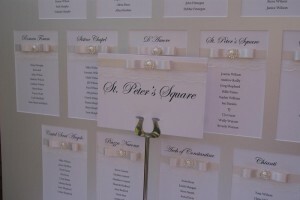 The seating cards are secured onto the tree with ribbon. 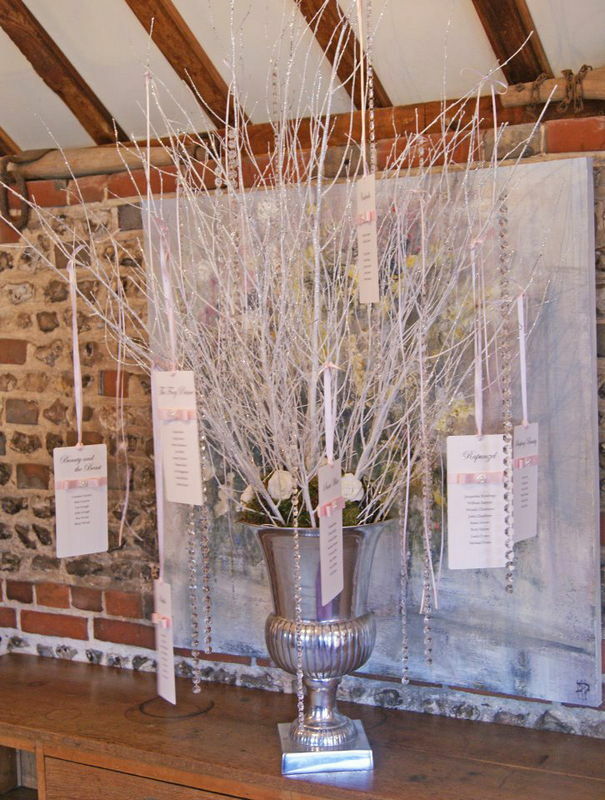 We have lots of detailing available for the tree including hanging crystals (shown here), hanging pearls, ribbons and butterflies. The tree can also be transformed into a wishing tree for the evening. 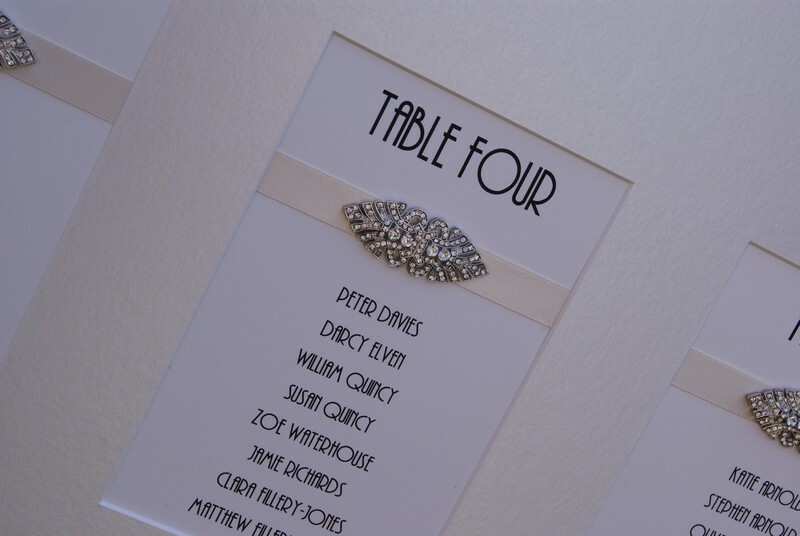 Here shows a silver board with silver Art Deco font. 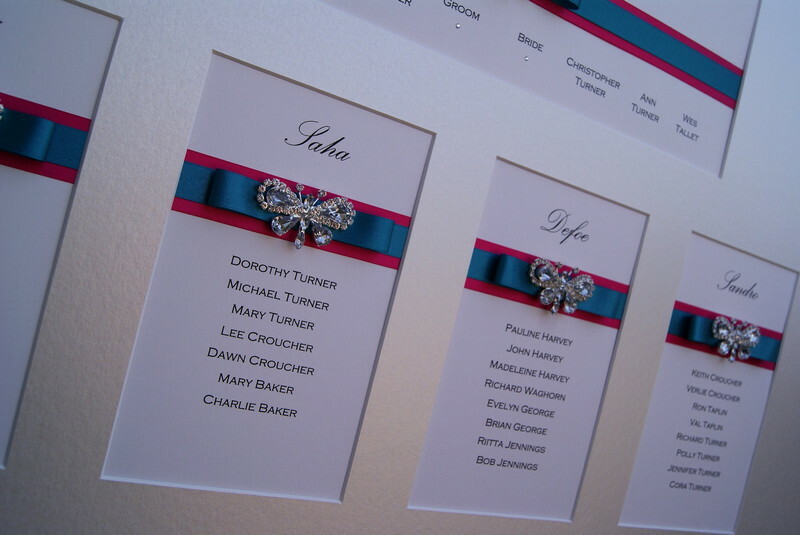 A flat ribbon finished with crystal Art Deco fans...oh and football players!